It’s an over obsessed upon commodity, previously hyped for its (Hubbert’s) “peak” status by “experts” like T Boone Pickens and a whole clown show of promoters amplified by the media at the time. Now WTI Crude Oil has reached a thick resistance zone (as managed in NFTRH for the last couple of years) and may be breaking down from a peak of a whole other kind. Here is the monthly chart we use. It is preliminary, and one weekend OPEC jawbone could put oil back up in the consolidation. But as of now the price has ticked below the previous 2018 low to close the week. 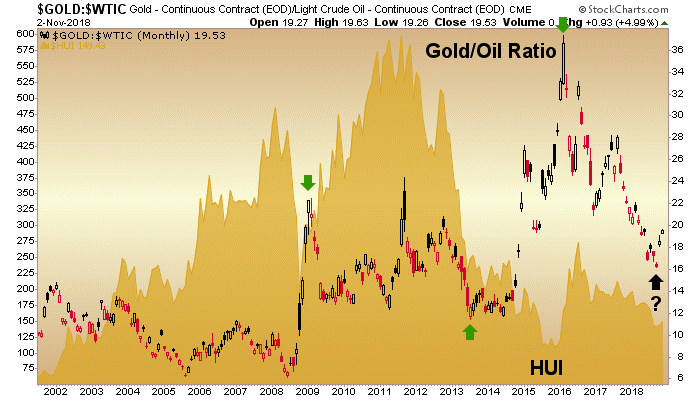 It is not a good look… unless you’re a gold bug, that is. More on that later. Here is a standard chart we use in NFTRH to keep an eye on the commodity complex from a big picture perspective. If Crude Oil were to hit the upper end of our resistance target it would break the trend line shown below. But it, Industrial Metals and the CRB index itself are all consolidating downward from these long-term trend lines. 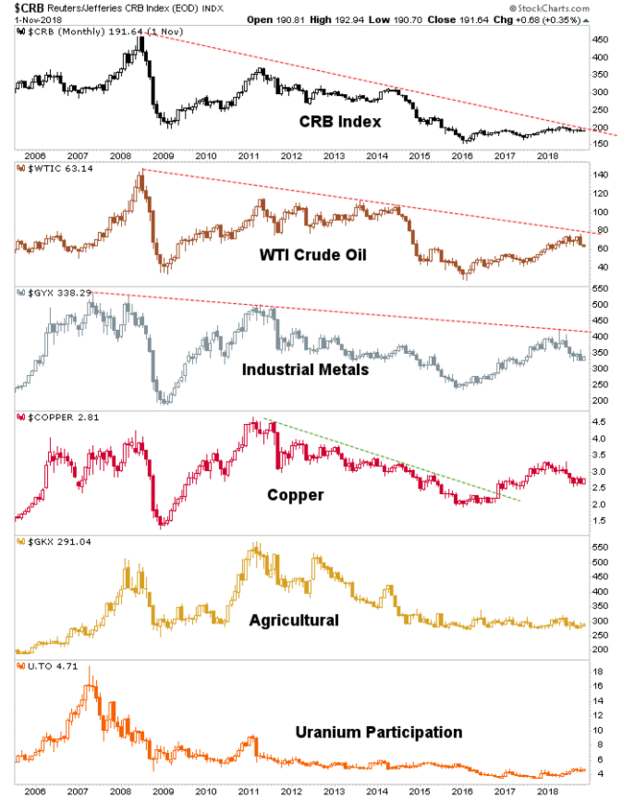 It’s a key time for commodities and the ‘inflation trade’. Break out or break down. Those are the options. Meanwhile, American job creation is brisk and the president is pumping all of this 24/7 leading into the mid-terms. But why are commodities so weak in this fiscally stimulated and reflated economy? If feels a lot like 2000 right now and in NFTRH last week we drew some important parallels to that time frame (when the gold miners bottomed) and today. That was a view of what the S&P 500 did back then and what it may well be in a process of doing now. All of that came at a time when the economy could not have been better as well. Think about that. 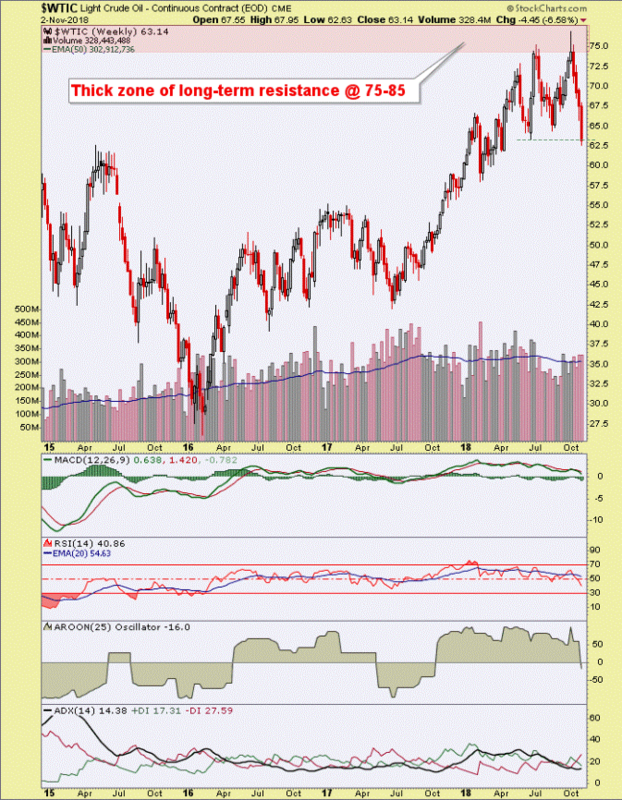 Gold vs. Stock Markets is a macro fundamental indicator for gold stocks. In other words, why buy the miners when stocks are out performing gold? So why again did we follow the 3 Amigos – including Amigo #1 (stocks vs. gold) – so closely? The answer is obvious. No rise in gold vs. stocks… no bull backdrop for the miners. If the GOR turns up, HUI could make your head spin to the upside if and when a proper valuation is applied the sector. The 2016 upturn in gold stocks came against a big upturn in the GOR. But a lid was kept on the gold mining sector in the form of recovering US and global stock markets (there’s that all-important macro consideration again!). The result has been chronically pressured valuations. Now, we gold bugs often need moderators, so know that the above is a slow moving monthly chart, we are in the heart of tax loss selling season with yet another losing year for gold stocks (as a whole, some quality operations did just fine) wrapping up. So this post is not implying people should run out and scoop ’em up hastily. I am personally trying to position with patience while trading around the shorter-terms. 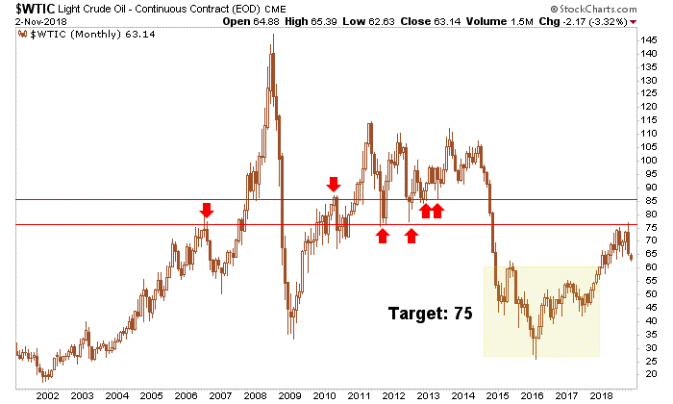 But if a different kind of peak is hitting Crude Oil and if the stock market resumes a bearish phase, we are likely nearing the end of a long wait for the next gold stock bull market to get going. Not hype; just the reality of the charts in this case.